The airport is located northwest of the city center and consists of five terminals (A, B, C, D and E). In the main building of the airport you will find Terminal A and Terminal B. From the north you can reach Berlin Tegel Airport via the A111 motorway, from the south, the airport is accessible via the A100 motorway (Berliner Stadtring). Berlin Tegel Airport is the busiest airport in Berlin, Berlin Schönefeld Airport. What is the distance from Berlin Tegel Airport to the center of Berlin? The distance between the airport and the center of Berlin is 12 kilometers by car takes at least 20 minutes to cover this distance. Which airline (airlines) flying to and from Berlin Tegel Airport? The full list can be found via this link, airlines Berlin Tegel Airport. 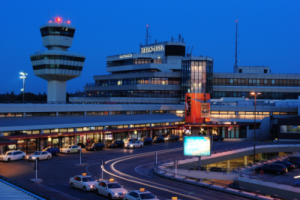 How to get to Berlin Tegel airport in Berlin? There is no railway station at the airport Berlin Tegel airport, you are therefore dependent on the bus if you want to go to the center of Berlin by public transport. The fastest alternative is JetExpressBus TXL from the Berlin Transport Authority (BVG) which 7 days a week every 6 to 10 minutes traveling to the airport and from the city. With this bus you are on average 40 minutes from Berlin Tegel Airport to Alexanderplatz in central Berlin. A ticket costs € 2.70 for adults and € 1.70 for children 6 t / m 14 (Einzelfahrschein, Berlin AB), tickets are valid for 120 minutes in all modes of transport. You can also get for example at Berlin Hauptbahnhof (22 minutes) or Berlin Brandenburg (30 minutes) and then travel on to your final destination by S-Bahn or U-Bahn, this is sometimes faster. More information can be found here, website and timetable JetExpressBus TXL. Would you then the Berlin City Pass for two during your stay public transportation including airport transfers and free the most famous museums (eg Museum Island) and sightseeing (Brandenburg Gate, Reichstag / Bundestag, Checkpoint Charlie, etc. ), 3 or 6 days a godsend. It will cost you around € 25 to travel to Berlin Tegel airport taxi to the center of Berlin. Taxis waiting at the exits of Terminal A, Terminal C and Terminal E. A cheap taxi adjusts advance through taxi Tender. Which car rental companies are present at Berlin Tegel Airport? In the “Mietwagencenter ‘nearby parking garage P2 are the car rental companies Avis, Budget, Enterprise, Europcar, Hertz, Sixt and Buchbinder located. Through EasyTerra Car Rental you can compare the prices of all providers and immediately take advantage of offers. What are the parking rates at Berlin Tegel Airport? Your car can be parked in the car parks P1, P2 and P5. It is also possible for outdoor parking P5 car park P10. The parking facilities are well signposted and are located within walking distance of the terminals, with the exception of P10. P1 is located on the lowest floor of Terminals A and B. P2 is the closest to terminals D and E, P5 is located opposite Terminal C. Check out the full list of parking fees Berlin Tegel Airport.